ROBO FORCE&GIANT ROBOT is for Ages 4-8. ROBO FORCE&GIANT ROBOT was written by SETH MCEVOY. ROBO FORCE&GIANT ROBOT was published by Random House Books For Young Readers. 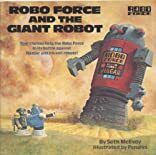 Subjects of ROBO FORCE&GIANT ROBOT include Children: Babies & Toddlers, Children: Grades 3-4, Fiction, General, Juvenile Fiction, Literary recreations, Non-Classifiable, Plot-your-own stories, Robots, and Science fiction.